My name is Roger Harris and I have been a Doctor Who fan all of my life. I was born in 1965 and so the Doctor that I grew up with was Jon Pertwee. I have been, and probably always will be, a huge fan of Jon's - one of the reasons that I set up this web site dedicated to him! Hopefully, I have quite an entertaining tale to tell here! Stick with it! 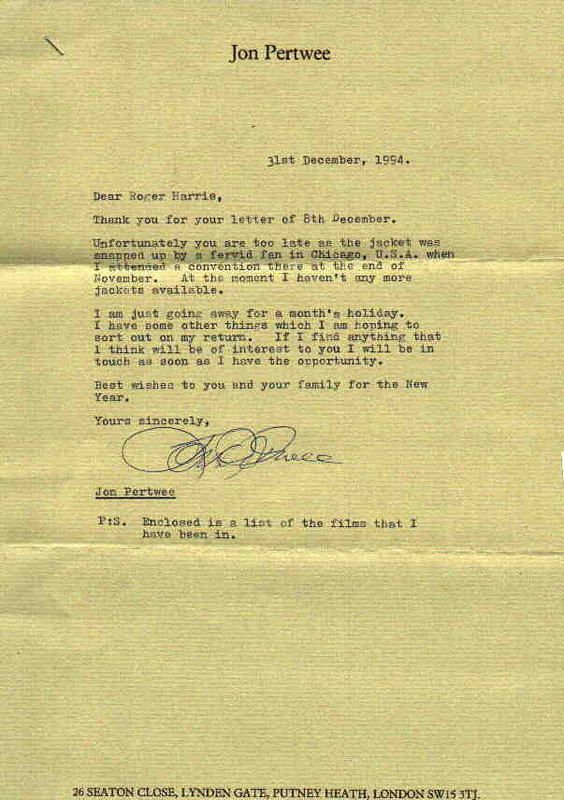 My first contact with Jon Pertwee was when I wrote to him in 1978. He sent me a really good signed and dedicated photo of himself in ordinary clothes. Unfortunately, the scan of the photograph is terrible so I haven't put it up for you to see! I wrote to him again in about 1980 and 1981 and on both occasions he sent me signed pictures of himself as 'Worzel Gummidge', the first one dedicated, the second one undedicated. I didn't bother to scan these. I first saw Jon in person at a Doctor Who convention in Brighton, held over three days, the 26th, 27th and 28th July 1985 but I didn't get to met him or get his autograph on that occasion. I hoped to get a chance to meet him again - but it was many years before I did. Then on 26th September 1993. I heard he was doing a signing at the Who shop in East Ham, London. I talked the wife into driving down with me, from Hereford to London (its a 300 mile round trip!). We drove down and parked in Earl's Court and then got the tube across London. It took hours. Then we queued up outside the shop. When Jon arrived to my surprise, the first thing he did was walk down the queue meeting people and shaking hands. The wife got the camera out and when it was my turn I shook his hand and said "It's a great pleasure to meet you Mr. Pertwee - would you mind if I had a photo?" Of course he didn't mind and the wife took a quick photo of us together. As you can see, it turned out pretty good. I had it blown up to poster size and framed and glazed and it looks down on me now as I type this. Eventually, Jon went inside and we waited ages until it was our turn to see him. I bought a large poster of him, which he signed "To Roger, Jon Pertwee, Doc No 3, 93" and a small photograph of him with a Dalek, which he signed and which you can see at the bottom of this page. Jon also signed my Doctor Who scrapbook. It was about this time that I set my heart on buying one of Jon's capes or jackets. I am a collector of film memorabilia and used to drive down to auctions of film and movie memorabilia at Bonhams in Chelsea. In either late 1993 or early 1994 one of Jon Pertwee's jackets came up for sale. The catalogue said it was from 'The Green Death'. I decided to drive down from Hereford to London to attend a viewing before the auction itself and have a look at it. It was that 300 mile round trip again, but I took my video camera with me. When I got to Bonhams I asked for permission to video the items on view for the coming auction and videoed Jon Pertwee's jacket in detail. I then came home and compared the video I made to the jacket Jon actually wore in 'The Green Death'. It wasn't the same one. Quite clearly. The cuffs were different as well as the cut. I went back to London to attend the auction a few days later (another 300 miles) as there were some other items that I wanted to buy, but I decided I was not going to bid for the jacket because it wasn't genuine. I watched the jacket sell for £900.00. In August 1994 another one of Jon Pertwee's jackets came up for auction at Bonhams. This time Bonhams said it was from 'Planet of the Spiders' and was being sold by Jon Pertwee himself with a signed letter of authenticity. This sounded very promising! I decided to forsake the 300 mile round trip but I wanted to satisfy myself that it really was from 'Planet of the Spiders'. I rang Bonhams and asked if they would send me photographs of the jacket - particularly of the sleeves and the cuffs. A few days later, a couple of Polaroid's turned up in the post of Jon's jacket. I got out my video of 'Planet of the Spiders' and carefully compared the jacket he wore in all six episodes to the Polaroid's. It was clearly NOT the same jacket. Disappointment again! How could this be? They said it was being sold by Jon himself with a letter of authenticity. It was late on a Saturday night in August 1994 and I was pondering this dilemma. I was paging through the BBC Ceefax. Then I came upon a page saying that Jon Pertwee was appearing at Longleat the following day. The solution to my problem! I'd go and ask him if it was his jacket or not! I had to talk the wife into it (not an easy task), but the following morning we got up early and drove to Longleat. There was a Doctor Who celebration on and in due course I saw Jon Pertwee sitting in 'Bessie', his car, and having his picture taken with people. I decided to queue up to have my photograph taken with him. Unfortunately, although we had taken our camera we had taken the last picture earlier in the day! My wife would have to pretend to take my photo with Jon so that I could get to talk to him! In due course, it was my turn. 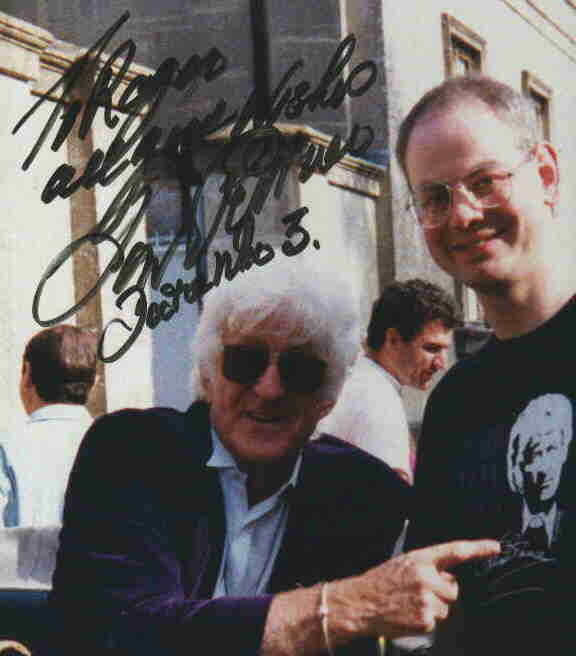 Jon laughed at my "Jon Pertwee" T-shirt that I was wearing and posed for the photograph by pointing to it. I said to Jon, "I see one of your Doctor Who jackets is being sold at Bonhams next week. They say its from your private collection, is that right?" "Yes" said Jon, "I'm hoping to make some money out of that ............"
Well, that was good enough for me! Who cares whether it was from Planet of the Spiders or not! Jon may have got confused over where it was from, but that didn't bother me one bit! It was one of Jon's Doctor Who jackets and I was going to have it! Bonhams here I come! There is a postscript to the photograph my wife took. She was at the end of the film and when she "took" a photograph of me with Jon, the camera immediately started to rewind. We had the film developed but, as expected, there was no photograph of me with Jon. However, if you held the negative up to the light............ you could see three quarters of a photo of me and Jon! I got this partial photograph developed and then had it blown up into a poster. It came out really well! I then posted this poster off to an address I had for Jon and asked him to sign it for me which he duly did! This is now also framed and glazed and looking down at me. He is a scan of part of it. In due course, the day of the auction arrived, 17th August 1994. Another 300 mile round trip. Now I had one slight problem with wanting this jacket, namely I didn't have any money! However Bonhams took credit cards and I had a £1500 limit on my visa card. The estimated price was £500 - £600, so I planned to buy it on my credit card and spend ages paying it off. You've got to buy these things when they come up or you may not get a chance again. I wanted this jacket so much! NOTHING was going to stop me. NOTHING. Jon's jacket was on display at the auction. Pinned to it was the signed letter of authenticity from Jon. The jacket was the last lot in the auction. There were a number of items I wanted to bid on but I only bought some lobby cards from the films 'Psycho' and 'The Sand Pebbles' as I was saving all my financial clout for the jacket. The bidding started, and I waited. I waited for it to reach it's top price, then I would come in and outbid everybody. There was a lot of interest in Jon's jacket. There were a number of telephone bidders. Eventually, the bidding was between two people, a telephone bidder and someone a few rows in front of me. Up and up the price went. £500, £600, £700, smashing through the estimated price. Eventually the guy in front of me dropped out and the telephone bidder had it at £950 or thereabouts. Going once!........ Going twice!........ I then I bid £1000. There was a pause as the telephone bidder considered his position. Did he want to go over a thousand pounds? I held my breath. Maybe I could get it for £1000........... The telephone assistant shook her head. That was it, he was out of it! It was going to be mine! I was over the moon! Going once........... Going twice........... and then a guy in the front row in the far corner bid £1050! Oh, no...... he had done what I was doing! Waiting until the last minute before coming in. I groaned inwardly. No, I was going to have to outbid him! £1100, £1200, the price shot up! My credit limit was £1500 and I was rapidly running out of credit! On top of the hammer price you have to pay a buyers premium of 10% and then VAT. I couldn't believe it! I was going to run out of money! I bid £1500 and I knew that had to be my final bid. That would be my entire credit limit and I'd have to cover the additional premiums with a cheque. Any more and I would not have been able to pay! The other guy bid £1550. I put my hand down. The item was knocked down to the guy at the front. I was gutted. My only chance to buy one of Jon's jackets when Jon himself had told me in person it was his and I had blown it. Run out of money! I was bitterly disappointed but I went over to congratulate my opponent as the auction had now ended. I shook his hand and said "Well done - I really wanted that jacket but you just outbid me". 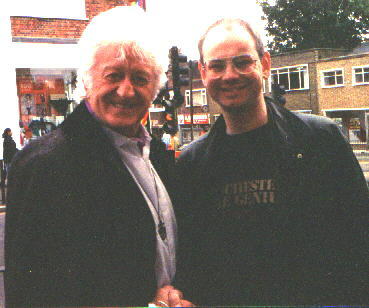 I then told him how I had spoken to Jon Pertwee a few days beforehand, and he had confirmed that it was his jacket. I also told him that if you compare the jacket to 'Planet of the Spiders' it isn't actually the same one, but at least it really was one of Jon Pertwee's jackets. I went home despondent. My day was complete when the lobby cards I bought turned out to be missing a card! They must have been mis-described in the catalogue. The entire day had been hugely disappointing. I was gutted. 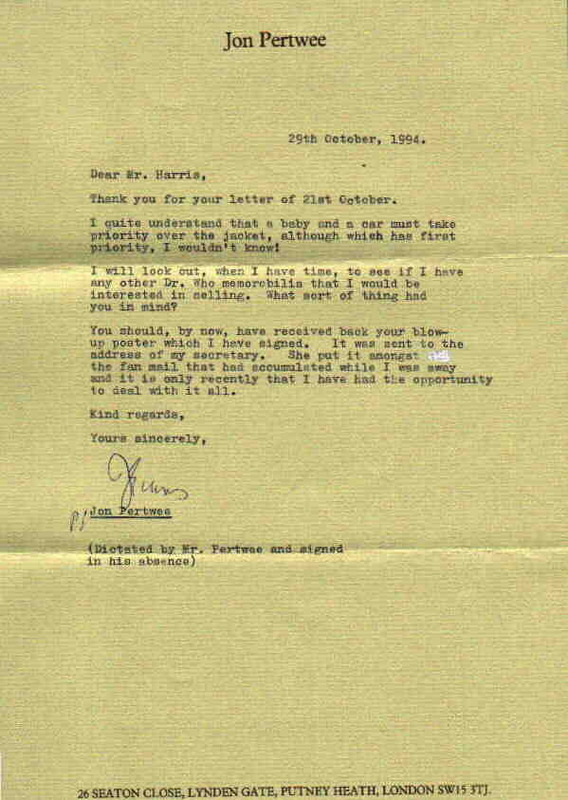 A few days later, on 20th August 1994, I decided to write to Jon to ask if he had any other capes or jackets for sale. I didn't get a reply and thought that was the end of it. What a strange situation! I didn't know you could return things to Auction Houses! Still if they said the jacket was from 'Planet of the Spiders' and it wasn't, then fair enough I suppose! Now I faced another dilemma. Jon had the jacket for sale again, but he already had a price in mind! It had sold for a grand total of £1732.12! He hadn't replied for two months so I had committed what money I had elsewhere. We had bought a car and something else had changed as well. We were now expecting a baby! ....... and that was going to be expensive. As much as I wanted Jon's jacket, I simply could not spend that amount of money. I wrote to Jon and told him that, and asked if he had another other cheaper items of Doctor Who memorabilia he might be interested in selling to me. 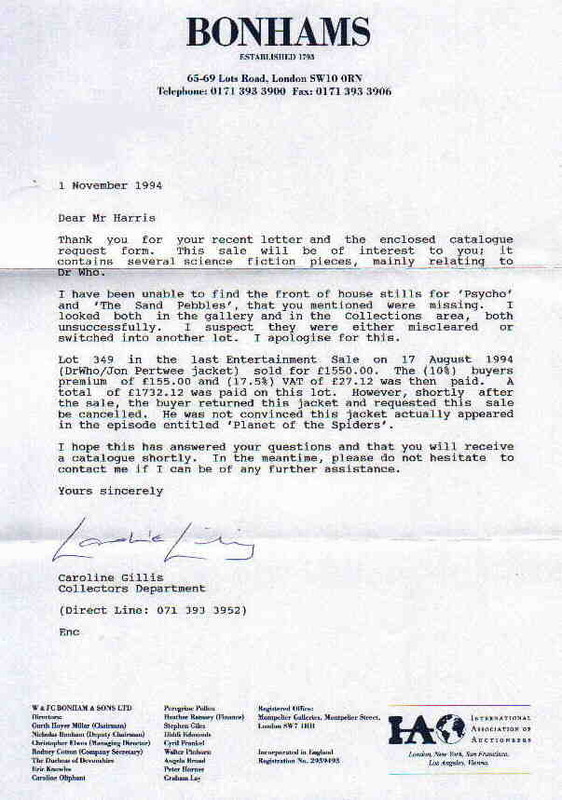 Later that year, I wrote again to Jon to enquire about the jacket and whether he still had it and to enquire about other items he might be willing to sell and I received this reply. In due course we had our baby - my son, Steve was born on my 30th birthday! - and that was the end of expensive memorabilia collecting for me. Then on Monday 20th May 1996, Jon Pertwee died. I remember the day well. Like so many fans it came as a personal blow. It also rekindled my interest in collecting Jon Pertwee memorabilia and I always bitterly regretted not being able to buy Jon's jacket when I had the chance. Then I went to a Doctor Who event at Longleat on Sunday 18th August 1996. There they had an auction of various Doctor Who costumes and items. The auction was conducted by John Nathan-Turner, a former producer of the programme. Amongst the items being sold were a number of lots billed as 'The Pertwee Collection'. 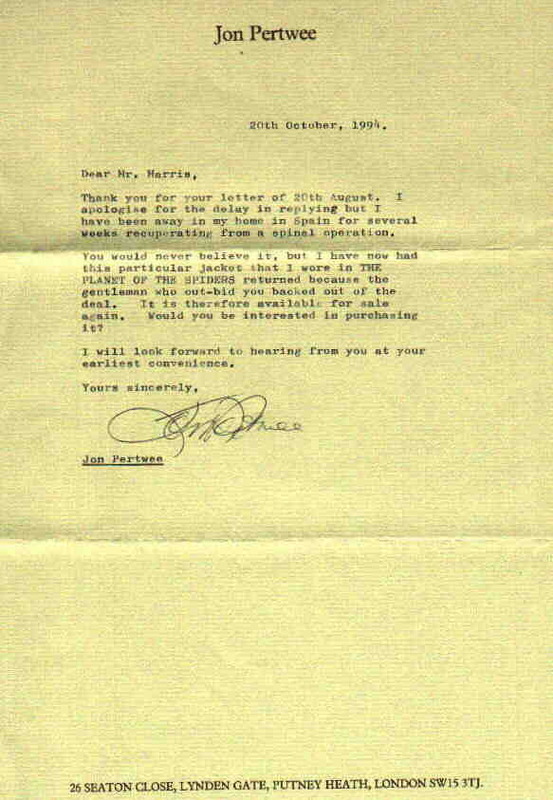 John Nathan-Turner informed all attenders at the auction that these lots were being sold by Mrs. Ingeborg Pertwee, the widow of Jon Pertwee, following Jon's death. Amongst the lots was Jon's Doctor Who cape and jacket! This was another chance! .... and it would be the last chance I felt, to get something which really was genuinely Jon's, without having to rely on a fan telling me it was Jon's. I knew that I couldn't afford to buy both the jacket and the cape so I would have to choose which one I was going to go for. I decided to go for the cape. I wasn't expecting this auction but I was armed with my credit card and this time I had a much higher credit limit! I had learnt a lesson from Bonhams in August 1994. The jacket sold and I let it go. However, I bid for, and purchased two lots. One was Jon Pertwee's own copy of the sheet music for the Doctor Who signature tune and the other was Jon's cape! I paid a large amount for it and I put it on the credit card. It took a long time to pay it off, but I was really pleased with my purchase as this was Jon's cape that he had worn as the Doctor in the 30th Anniversary Special 'Dimensions in Time' which was transmitted on Friday 26th November 1993 and Saturday 27th November 1993. He also wore it on the cover of the Radio Times that week. It was also the one which he wore when we had our photograph taken together in September 1993! ...... and, I had a signed photograph of Jon wearing the cape! Later on in 1996, I think it was October, I attended the Doctor Who convention at Coventry and there was another auction their, to raise money for charity, conducted by Caroline John ("Liz Shaw" from Doctor Who). I bought two more of Jon's items donated by Mrs. Pertwee, from Jon's own office. These were Jon's own copy of a Jon Pertwee Doctor Who Annual and Jon's own copy of the 20th anniversary Radio Times Doctor Who Special. My cape has always been one of my most treasured possessions. However, as we now have a second baby, I can no longer afford the extravagance of keeping it and, very reluctantly, I have put it up for sale. You can find out all the relevant details by clicking the small cartoon of Jon below. This drawing of Jon was on a little sticky label that was used to seal the letter that Jon sent me, enclosing an autographed photo, back in 1978. I still buy the occasional item of Jon Pertwee memorabilia. However, my big spending days are now over, with my family commitments. That said, I recently bought the web domain name www.jonpertwee.com - mainly because (to my utter astonishment!) it was still available. I have now set up this web site and I plan to set up others too. My interest in Doctor Who has always stemmed from Jon Pertwee. Thanks, Jon! Wherever you are! You have been and always will be, one of my greatest heros!